Time to go get a semla! 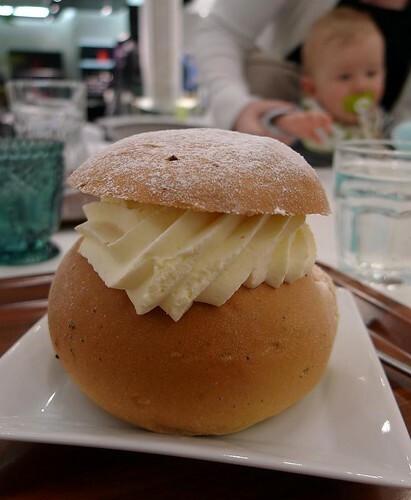 The rest of the world might eat pancakes on Shrove Tuesday - today - but in Sweden, you stock up a little bit more before lent and have a semla. It's a yeasted cardamon bun filled with almond paste and whipped cream, and I assure you it''s much better than it sounds. Well, in truth, there's a big range from horribly bad to heavenly good, since ever store offer up semlor this time of year . You can find them in 7-11, gas stations and grocery stores, but my advice is to seek out the very best bakeries instead. If you read Swedish, Semmelmannen has very thorough reviews of all sorts of semlor! I think that sounds gorgeous, so I don't know how it could be better! That looks delicious! I love seeing all the different indulgences of today.